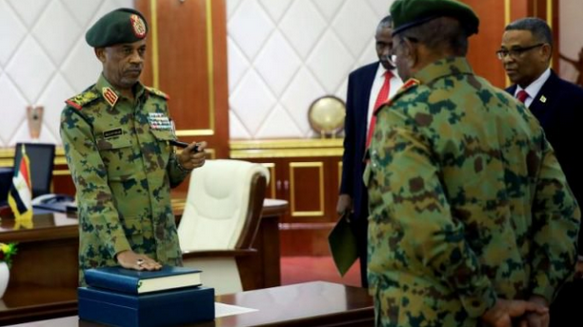 Sudan’s defence minister, Awad Ibn Auf, has stood down a day after leading a coup that toppled long-time leader Omar al-Bashir amid a wave of protests. He announced his decision in a nationwide broadcast on state TV on Friday. He named as his successor Lt Gen Abdel Fattah Abdelrahman Burhan. But the protesters who had earlier demanded the resignation of al-Bashir before the military ended the 30-year regime of the former president, had mounted pressure on the military to leave. President Bashir's downfall followed months of unrest that began in December over rising prices. At least 38 people have died in the protests. Bashir has been indicted by the International Criminal Court (ICC) on charges of war crimes and crimes against humanity over that conflict. However, the military has said it won’t handover the ousted president to ICC.